jobs.ac.uk, the global jobs board for academic, research, science and related professions has increased the number of unique browsers to its site by 91% in just 12 months, according to the latest independently audited figures released by the ABC today. 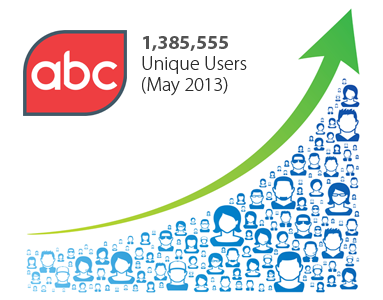 The latest ABC figures revealed that jobs.ac.uk attracted a record 1,385,555 unique browsers in May 2013, up from 726,627 in 2012, and the highest number of unique browsers in the site’s 15 year history. The record-breaking levels of traffic follow a strategic investment over the past 12 months in marketing and web development, including improving the site’s SEO presence in Google and extending its reach worldwide with targeted advertising, social media marketing, mobile app promotion and sponsoring key conferences across the globe. In addition, jobs.ac.uk has also upgraded the platform supporting their site to improve the overall performance for jobseekers. Furthermore, with Higher Education becoming increasingly more global and universities worldwide looking to recruit the best international academic staff, jobs.ac.uk has also focused its efforts on attracting more international jobseekers to the site to aid academic mobility worldwide. As a result, the specialist jobs board now also attracts a large international audience with 32% jobseekers coming from outside the UK including Europe, USA, Middle East and Asia Pacific (Source: Google Analytics). “This has been a really fantastic year for jobs.ac.uk. Our latest ABC audit highlights a significant increase in the volume of traffic when compared to last year and clearly shows that jobs.ac.uk has a loyal and growing user base. Over the past 12 months we’ve invested heavily in improving the service we offer, building our brand and growing our audience worldwide to drive the best and most relevant jobseekers to our customers’ vacancies. It’s therefore very encouraging to see that our continuous drive and investment is reflected in these new figures by the ABC”. “Congratulations to jobs.ac.uk on achieving another impressive increase in its number of Monthly Unique Browsers! Through its ongoing commitment to independent verification of the site’s traffic data to industry agreed standards, jobs.ac.uk continues to deliver clarity and transparency for its advertisers”. View the official ABC certificate for jobs.ac.uk here. The ABC Board consists of 16 media owners, media agencies, advertisers and trade body members – with 25 per cent of the Board representing the digital sector. The Board make strategic decisions as to how ABC is run and each industry sector is represented by a Reporting Standards Group.